Two unique colors in one compact match all skin tones. Concealer creates a natural appearance and is easy to apply. Use to disguise fine lines, under eye circles, puffs, bruises, scars, burns, blemishes and other skin discolorations. Fragrance free. Concealer creates a natural appearance and is easy to apply. Use to disguise fine lines, under eye circles, puffs, bruises, scars, burns, blemishes and other skin discolorations. Fragrance free. Formulated to mask difficult discolorations. An orange color is applied as a primer for the concealer. Provides excellent coverage for undereye circles and after surgery. Formulated to mask difficult discolorations. An amber color is applied as a primer for the concealer. Provides excellent coverage for undereye circles and after surgery. This heavy coverage cream concealer hides and helps heal imperfections from scars, burns, birthmarks, rosacea and veins. Apply to problem area using self contained wand and blend with camoflage brush and set with powder combo. Select color. 0.3 ounces. Two unique colors in one pencil match all skin tones. Concealer pencil conceals flaws and is water resistant and smudge-proof. Easy to apply. This white opaque concealer is especially formulated for the eye lid to cover discoloration. The smooth texture glides on easily and allows the eye shadow to show its true color. 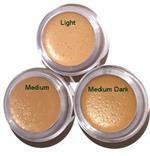 A lightweight powder used to set concealers. Covers imperfections and provides a smooth, natural appearance. This matte powder evens skin tones, covers flaws, and is long lasting. Apply with a R1 Brush.